The Clovis were and early people who left campsites and artifacts showing they were here as early as 12,000 years ago. That means that they overlapped with a very rich collection of marvelous animals that are now extinct. Their hunting parties must have been extraordinary adventures. For a brief period at the end of the Pleistocene ice age, the lives of humans and mastodons, dire wolves, saber-toothed cats, horses and camels intertwined. 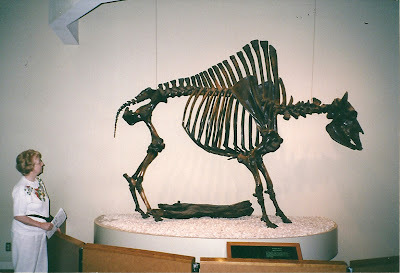 Some years ago, I was introduced to the fact that huge mammals once resided in North America. It was only recently, however, when I visited the La Brea tar pits in Los Angeles, that I began to fully appreciate that my home state of Missouri was also once home to some of these same giants. Several thousand years ago the giant sloth in Missouri could reach 20 feet in height standing on its hind legs. That made the eight-foot sloth in California small by comparison. When hungry, the giant sloth could push over a tree to get its lunch. Can you image what it must have been like to hunt such a creature? In addition, Missouri had animals not found in the California tar pits: giant armadillos, mush oxen, tapirs and peccaries (pig-like animals). 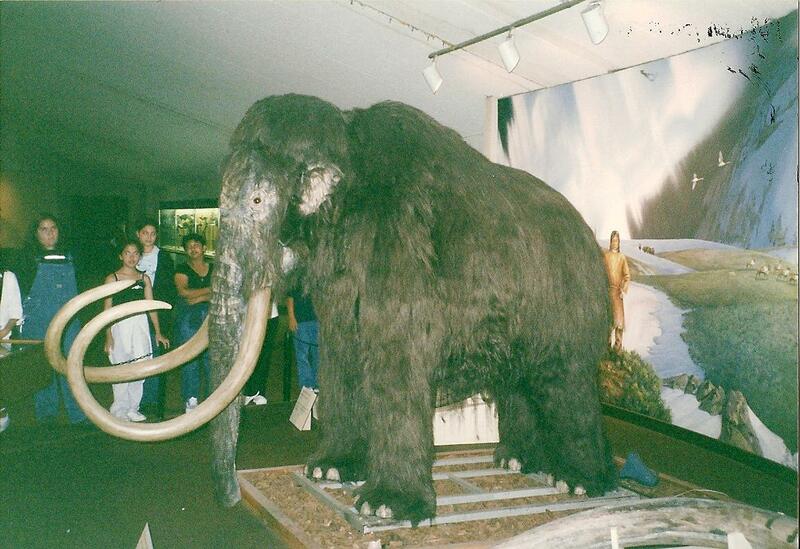 The best nearby site for seeing a full-sized replica of a mastodon is at the Mastodon State Historical Site, 20 miles south of St. Louis on Interstate 55. The museum holds a large collection of bones, tusks and human artifacts from the Kimmswick Bone Beds, which are located a brief walk from the museum. On occasion the museum hosts special events such as a flint knapping demonstration on when artisans will create stone tools and skin deer hides. Visitors also get a chance to throw spears and engage in other activities of early humans. Not only did Native Americans kill and butcher mastodons at the Kimmswick Site, they also crafted stone weapons and tools there. These Paleolithic people, we now call the Clovis people, were excellent artisans and skilled big-game hunters. Some years ago at an Elderhostel called "Clan of the Cave Bear" at Colorado State University, I visited a site where early hunters had killed a mammoth. Our instructor explained that they would have used throwing sticks to launch their spears hard enough to penetrate the great beast’s thick skin. Clearly, it would have taken many spears to bring down such a giant. Thirteen thousand years ago, the Missouri area was much cooler and wetter than it is today, with many swamps and ponds. The forests were made up of evergreens, providing an ideal diet for mastodons. Mastodons were a bit smaller than mammoths. They had straighter tusks, longer bodies and were covered with coarse, reddish-brown hair. They preferred woodlands, while mammoths preferred grasslands. In 1799, the French anatomist Cuvier realized that bones that had been discovered earlier were those of an elephant-like animal he named "mastodon." Thomas Jefferson asked Lewis and Clark to find out if mastodons still existed in the West. In 1840, a Dr. Albert Koch collected enough bones to build a skeleton that he displayed in a museum near the present site of the St. Louis Arch. The phrase "I saw the elephant," which means "I saw something amazing," was perhaps coined by pioneers who visited Koch’s museum as they passed through St. Louis on their way west. Visitors can see a life-scene depicting a Clovis campsite as it may have appeared at Mastodon State Park 11,000 years ago. The Indians, who moved about in search of game, are shown performing common tasks associated with the prehistoric culture. Lions and tigers and bears! Oh, my! When you enter the Page Museum at the La Brea tar pits in central Los Angeles, you know you’re no longer in Kansas, and you’re surely not in the Land of Oz. But you are definitely seeing the remains of a world that was very different from the one we now live in. This is a world that the early Indians would have been quite familiar with. Some even accuse the early Indians of causing the extinction of these remarkable beasts. At the Page Museum, one of the most famous fossil repositories in the world, you can take in the well-preserved skeletal remains of beasts and birds that inhabited this part of the world during the late Pleistocene Epoch, from 8,000 to 40,000 years ago. Here, their blackened skeletons rest on pedestals and majestically overlook fascinated audiences. Tourists and school children stand engrossed as guides describe life and death during the last Ice Age. 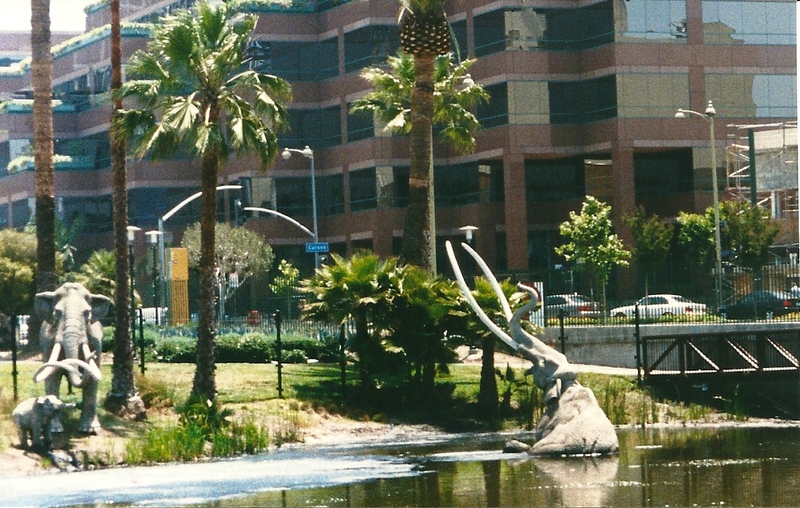 The La Brea tar pits have produced one of the world’s best-preserved collections of Pleistocene vertebrates, including 59 mammal species and more than 135 bird species. The animals that lived here then were different from the animals in modern America in a number of ways. First, there were large camels and a western horse, both of which originated on the American continent some 45 million years ago. Both eventually migrated to Asia, Africa and Europe, but they became extinct here about 10,000 years ago. 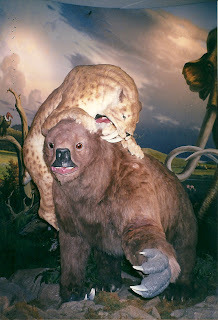 The second astonishing fact is that the saber-toothed cats, lions, bears and many other now-extinct mammals were king-size models of their species. For example, the short-faced bear was a foot taller and twice as heavy as a grizzly bear. 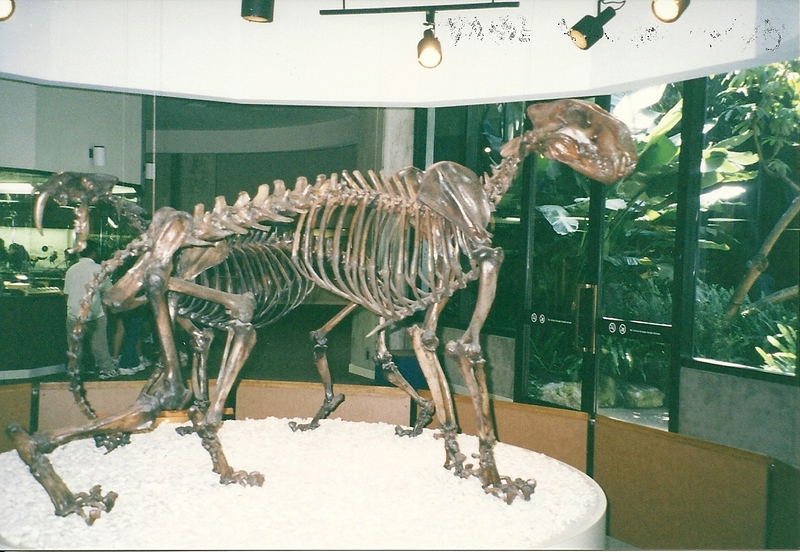 The saber-toothed cat and the American lion were both bigger than any modern cat. 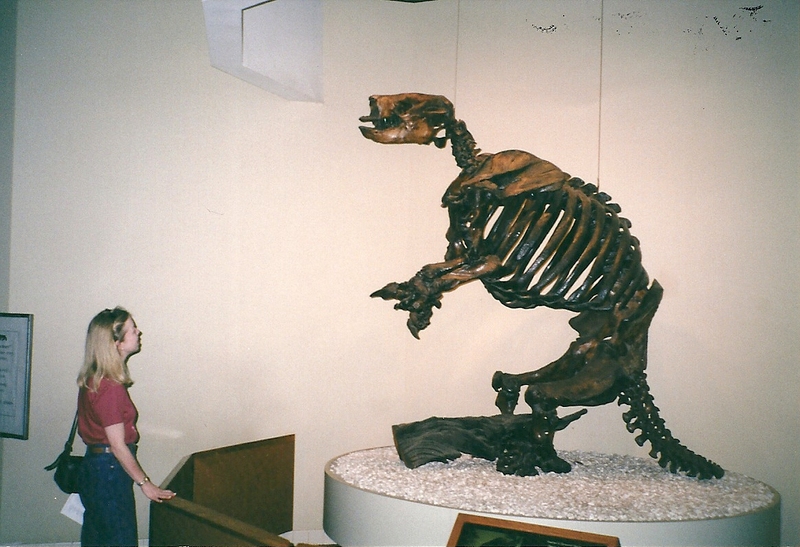 Giant sloths stood eight feet high and weighed 1,500 pounds. This was a world in which a normal human would have seemed diminutive. Despite their lack of size in this world of giants, Native Americans hunted even the largest animals: the 15,000-plus-pound, 12-foot-tall Columbian mammoth and its slightly smaller relative, the American mastodon. Crude oil seeping through fissures in the Earth’s crust created sticky pools of heavy tar or asphalt. Native Americans used the tar for waterproofing baskets and canoes, and later Westerners used it for roofing. In 1901, scientists from the University of California at Berkeley realized that the bones they were finding in the tar pits were not those of unlucky cattle. The unusual circumstances at the pits provides a time capsule from which to study life as it existed in North America during the last Ice Age. Strangely, about 90 percent of the bones are those of predators rather than of prey. When a prey animal found itself stuck in the viscous tar, a variety of predators would descend upon it and in turn would find themselves trapped. Over thousands of years, many species became victims, and thousands of intact skeletons have been recovered. The bones of 1,600 dire wolves have been recovered from the tar, the largest number of skeletons of any animal. These wolves had a larger head but smaller brain than do present-day wolves, and teeth that could crush bones. They were probably scavengers like modern-day hyenas. 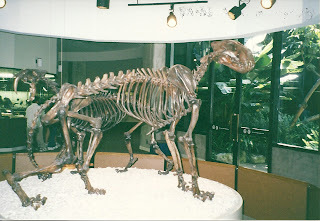 The second most-abundant skeleton is that of smilodon, the most famous of the giant saber-toothed cats. There are also hundreds of skeletons of condors, giant eagles and other birds of prey. Native Americans were present in the area toward the end of the Pleistocene, but researchers have so far recovered only one human skeleton from the tar, that of a small woman in her early 20s. Her 9,000-year-old skull is fractured in several places, leading some scientists to believe she may have been killed and deliberately placed in one of the pits. Some researchers believe that humans were responsible for the mass extinction of the giant animals, probably by overhunting. Another theory holds that humans carried fatal diseases as they spread through territory where megafauna lived. Despite the considerable evidence presented by these scientists, I find the overhunting theory unlikely because extinction was so widespread and covered so many species. It is just as likely in my mind that these huge hunting animals became so efficient that they killed off their food supply and starved to death. The museum’s scientists work behind glass windows in the Fossil Preparation Laboratory. Here, visitors can observe every step of the careful reconstruction process as bones are cleaned, repaired and then fitted together and displayed in large, high-ceilinged rooms. For some displays, fur and feathers get reproduced so you can see what paleontologists think the animals looked like in life. At Pit 91, an observation station allows a close-up examination of work in the field. Through Sept. 9, visitors can watch paleontologists recover bones from the tar. An atrium contains plants that existed in the area during the Pleistocene. A 23-acre park with life-sized replicas of extinct animals surrounds the museum. 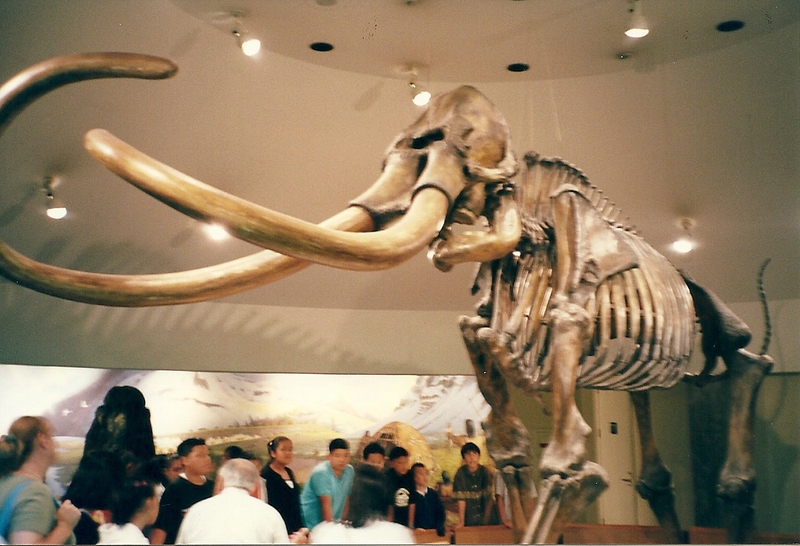 The most exciting replica is of a male mammoth struggling in tar as a female mammoth and a young mammoth look on. The park landscape also includes plants present during the last Ice Age. The Page Museum is located at 5801 Wilshire Boulevard in Los Angeles, in the "Miracle Mile" district. It is open seven days a week. My daughter Debra admires a giant ground sloth.